The president's annual State of the Union address is often seen as a formal, serious affair, but in the Hillsboro Civic Center on Tuesday night, surrounding by bicyclists, plenty of jokes and a parody video of Billy Joel's "We Didn't Start the Fire," Hillsboro Mayor Steve Callaway's annual State of the City was anything but. 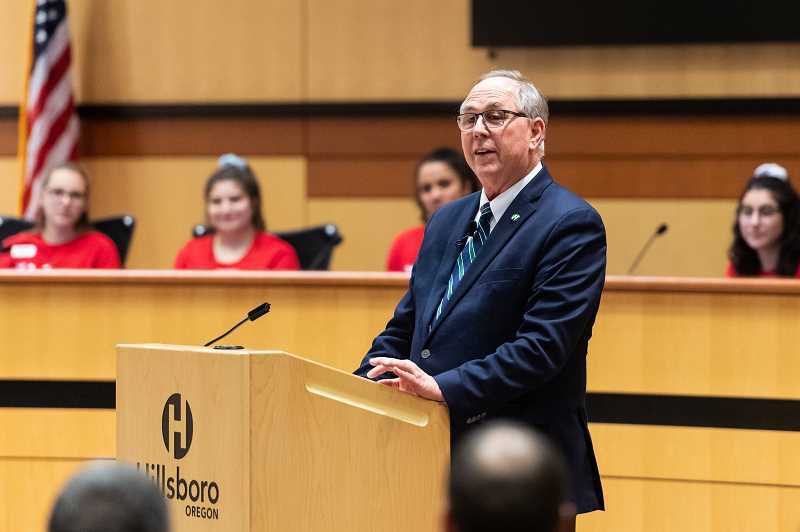 Callaway, who has served as Hillsboro's mayor since 2017, said the annual address is meant to be a celebration of the city's accomplishments, and a look toward the future. "The city loves to have fun," Callaway told a packed crowd on Jan. 29. "It's true in everything we do, including our state of the city." "As a city government, we never shut down," Callaway said, poking fun at the partial shutdown of the federal government, which ended last week after more than a month. "Since Oct. 19, 1876 we have been serving our community for 52,042 consecutive days, plus about 18 hours and 10 minutes. Cities don't shut down and our budgets always balance." In a city where more than one-quarter of the population is non-white, the city has launched a plan to bring more cultural arts to the city, and purchased children's books for its city libraries in seven new languages. It launched a Spanish-language city newsletter and continued its mission to engage the community through its Civic Leadership Academy, which works to prepare residents to serve on city boards and commissions. City Councilor Beach Pace is the first graduate of the program to be elected to the Council. "We're taking the time to get it right," Callaway said. On the transportation front, Hillsboro's roads have been busy. Work crews spread 20,000 tons of asphalt on city streets last year and roads in South Hillsboro — a massive new neighborhood along Tualatin Valley Highway — opened to the public, including an extension of Cornelius Pass Road. TriMet's Line 57 has returned to 24-hour service after many years, and the city helped expand the Link shuttle bus line into North Hillsboro. The years-long expansion of Highway 26 also finally wrapped up, widening the Sunset Highway to three lanes in both directions between Cornelius Pass Road and 185th Avenue. Hillsboro's roads have also been in the news for tragedy. Last year, eight people were killed on Hillsboro roads in traffic crashes, many of them pedestrians crossing city streets. Callaway said everyone, drivers and pedestrians, need to be safe when out on Hillsboro's roads. "Safety is paramount," Callaway said. "We all bare a responsibility to be mindful of the safety of others, and our own safety; especially as drivers when we are traveling in the dark. It doesn't matter whether we are on state highways, county roads, or city streets. We must be vigilant." The city has received plenty of accolades for its sustainability work, as well, Callaway said. Hillsboro city's offices use 26 percent less energy than they did in 2009, the greatest improvement of any public agency in the nation, according to the U.S. Department of Energy. The city is the No. 1 green power user in America, Callaway said. "In a city to city compassion, we're surpassing New York, Los Angeles, and every other city," Callaway said. The city's new high-speed internet service is expected to launch in 2019 as well. The city will operate the service as a city utility. "We believe this is an essential service," Callaway said. "It has to be acessible for all students, families businesses and nonprofits." The city will break ground on a new community center near 53rd Avenue Park later this year and will continue work on the Willamette Water Supply Program, a new water system the city is building in conjunction with Tualatin Valley Water District. That project isn't expected to wrap up until 2026. But while the city is experiencing rapid growth in its housing stock, there's plenty of work to do with the area's homeless, Callaway said. "As a community, we are addressing this issue with compassion," he said. Last year, the city's police department hired a homeless liaison, tasked with developing connections with the homeless and helping them navigate local services, Callaway said. The city has launched a new jobs placement program for homeless youth and is working on its third year of Camp EAGLE, a three-day summer camp for children at risk of homelessness. In July the city's new ban on plastic bags will go into effect at area grocery stores, restaurants and other shops. The ban was first proposed by Hillsboro's Youth Advisory Council, a group of area teenagers who work with the Council on issues related to area youth. "I want to say thank you to our youth." You all have made our city and our world a better place."